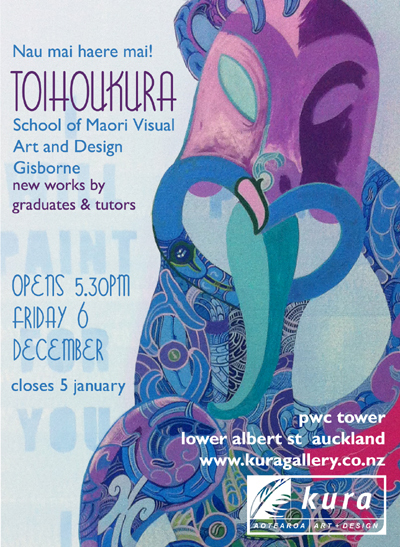 EXHIBITION AUCKLAND – TOIHOUKURA School of Maori Visual Art and Design – Gisborne – Kura Gallery: Maori and New Zealand Art + Design. An exhibition of new works by graduates and tutors. On 1 January 2011, Tairawhiti Polytechnic officially merged with EIT Taradale becoming the off-site campus now known as EIT Tairawhiti. of autonomy, creative license, and close links to hapu, iwi and wider Maori community groups. Whakapoua te hi o Rua kia rarama. acknowledged so that understanding and enlightenment are achieved. This finds its foundation in the story of how the three baskets of knowledge were acquired by Tane from the Twelfth Heaven and the sacred gods – the knowledge to be shared amongst mankind. It is this thread that connects us with the power of higher learning and the pursuit of knowledge – so that we may find the world of light, and the world of living. It is a growing art, a veritable art, a living art!